Nicola Brandt, Illuminated, Unrecounted, Diaz Point, Namibia, 2013. Digital Pigment Print, 119 x 86 cm, Edition of 3 + 2AP, Courtesy of the artist and Guns & Rain. 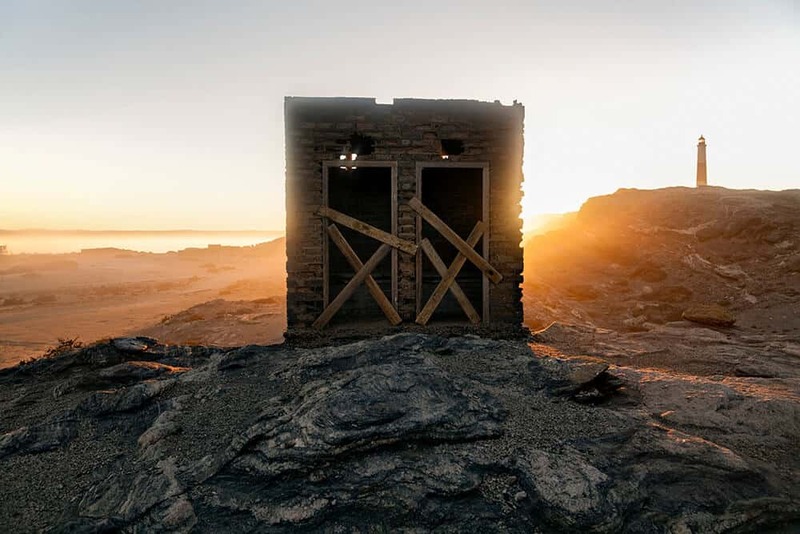 On the rocky, southern coastline of Namibia, Illuminated, Unrecounted was taken at Diaz Point at sunrise, where a dilapidated structure is lit in a halo of tangerine, yellow and red light. 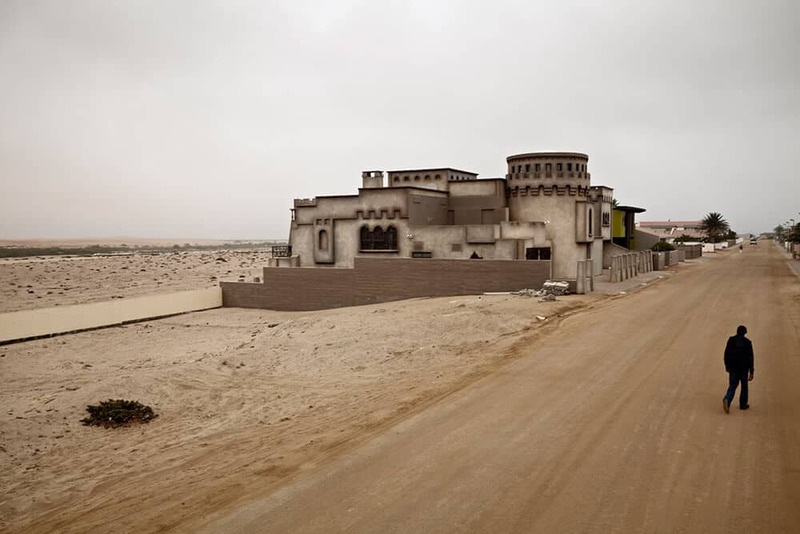 Against a grey sky, the building stands on the barren, desert shoreline where once Portuguese, and later, German colonialists, first set foot. It is an image that recalls the strange beauty of a haunted space. The remains of a more recent past are embedded in the veneer of the structure, yet the intricacies of a site’s lived experiences are hidden and unheard. The artist, keenly aware of the limitations of a traditional documentary mode, emphasises the gaps and silences in both the landscapes and in her photography and video work, which cannot make visible the experiences of the past. Nevertheless, the viewer can imagine the absences of a time forgotten. Not too far away from this stretch of coastline, a peninsula, infamously known as ‘Shark Island’, German colonial authorities used the land as a prisoner-of-war camp for the Herero and Nama people. The suffocating silence recalls the death of those unjustly discarded. The juxtaposition of the structure with the lighthouse against an otherwise sublime landscape challenges the viewer to look underneath the traumatized surface. Nicola Brandt (b. 1983) considers points of articulation between and among scales of violence in landscapes of trauma in her home country, Namibia. Her work examines the legacy of German colonial occupation in the late nineteenth and early twentieth centuries. 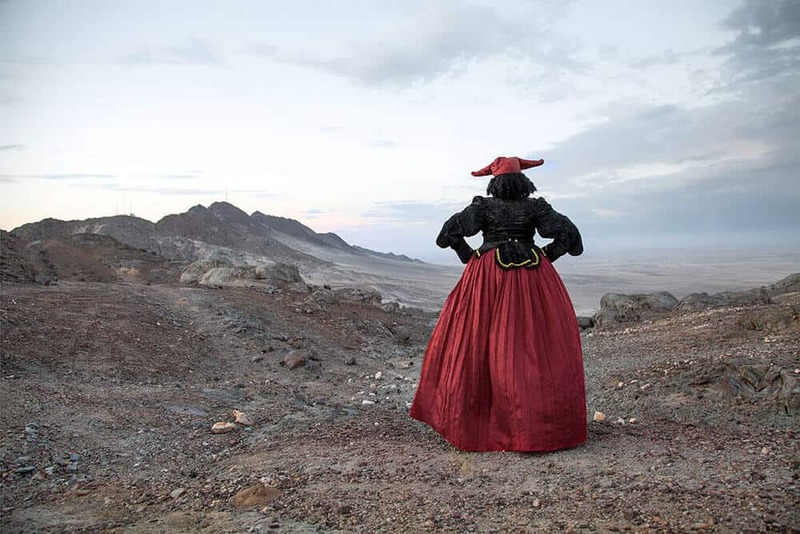 Overlaying the stories of Herero, Nama, and German Namibians, Nicola’s images are iconotexts. Her images emphasise the need for intertextual and cross-cultural conversations about the legacies of colonialism and potential futures. We are made aware of the ways in which the past continues to erupt the present. In some images, female figures inhabit mysterious, unsettling landscapes of what could appear to be in some future time. They are left to roam in spaces, where abjection, violation, and invisibility seem to no longer be in question, and yet, the land appears haunted. As they move defiantly through these hostile territories, the experience is a fragmented one, caught between traumatic pasts and uncertain futures. Nicola Brandt, Next to the Graves, Swakopmund, 2012. Digital Pigment Print, 72.4 x 52.6 cm (paper size); 65 x 43.4 cm (photograph), Edition of 3 + 2AP, Courtesy of the artist and Guns & Rain. 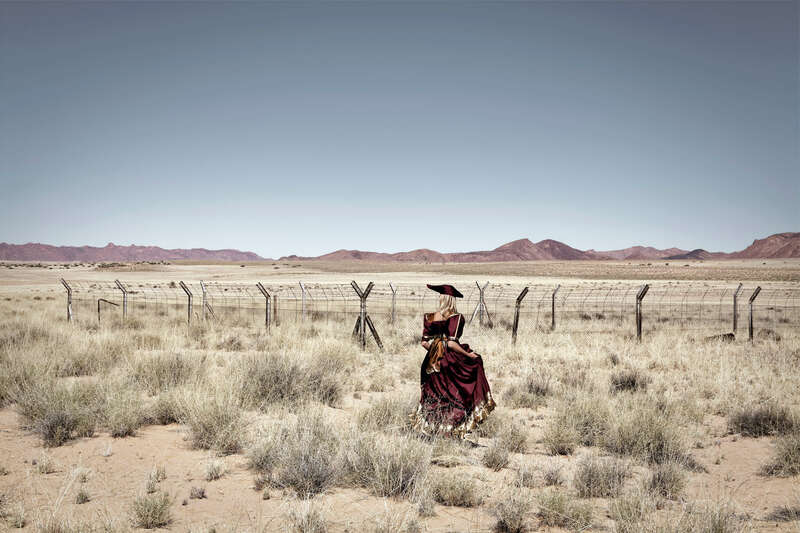 Nicola Brandt, Across the River, Uakondjisa Kakuekuee Mbari, Swakopmund, Namib Desert, 2013, 73 x 100cm (paper size); 60 x 90cm (photo size), Digital Pigment Print, Edition of 3 + 2AP, Courtesy of the artist and Guns & Rain. Brandt’s images demonstrate the centrality and endurance of violence in debates about power, politics, and the postcolony throughout Africa. Though Nicola admits herself that the burdens of history are not easily overcome, her images are an offering of reconciliation. Her work is an attempt to facilitate critical dialogue about the ways in which suffering is experienced collectively. As a Namibian of German heritage, her engagement with the question of who constitutes the ‘we’ in postcolonial Namibia is an effort to acknowledge the contrapuntal nature of Namibian identity. The histories of Germans, Herero, or the Nama are not visualised in terms of separate development, but of entangled co-constitution that bespeaks the complex nature of identity. The willed amnesia of many in Namibia bear traces in the landscapes Nicola captures. Inspired by the works of David Goldblatt, Santu Mofokeng, the Black Audio Film Collective, Arthur Jafa, Zarina Bhimji, and Ursula Biemann, among others, Nicola adds to the rich canon of lens-based documentary practices. Her images make visible the complex social and political worlds of people, places, and things. Nicola’s engagement with the Namibian landscape is a way to hounor alternative stories that nationalist history fails to remember. 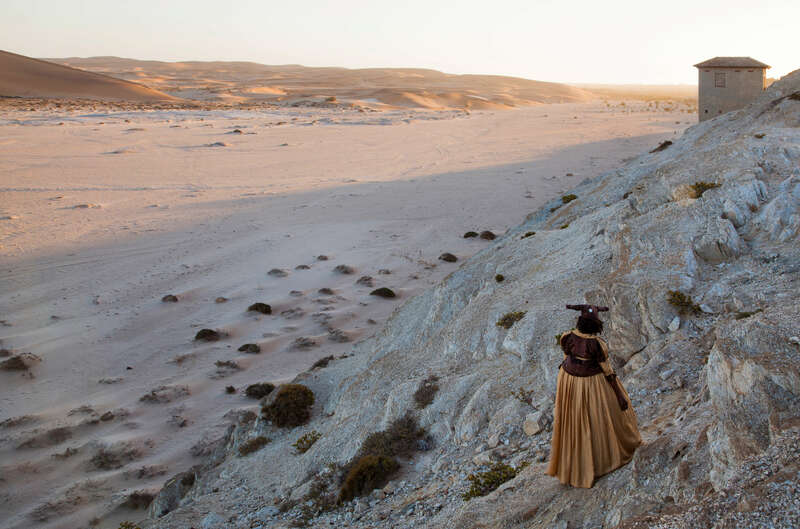 Nicola Brandt, The Return, En route to !Nami≠nüs/Lüderitz, Namibia, 2012. Digital Pigment Print, 73 x 100cm (paper size); 60 x 90cm (photo size), Edition of 3 + 2AP, Courtesy of the artist and Guns & Rain. Her work takes seriously the legacies of trauma and the demands it places on vulnerable communities. Invited to wear the Herero dress by one of her interlocutors Uakondjisa Kakuekuee Mbari, the dress was first introduced to Namibia by European missionaries and is still worn by Herero women today, particularly on special occasions. By acknowledging the asymmetrical relationship between colonised and coloniser, Nicola’s work attempts to make legible gaps in history. Nicola’s work has been shown alongside the late German artist Christoph Schlingensief in a fringe exhibition during the 2015 Venice Biennale. Her multiscreen video installation Indifference (2015) continues to be a deep meditation on racial violence and memory and was recently screened at the Iwalewahaus in Bayreuth, Germany and the MAXXI National Museum of Contemporary Art in Rome. Nicola has exhibited in group exhibitions in several countries including Namibia, Germany, Italy, the United States and the United Kingdom. The artist is currently a recipient of a one-year fine art fellowship (2017-2018) with the generous support of The Gerda Henkel Foundation. Denise Lim received her bachelor’s degree in English literature and Sociology at Bryn Mawr College and her master’s degree in African Studies at Yale University. She is currently a Ph.D candidate in Sociology at Yale with research interests in sociological approaches to African literatures and South African visual cultures. Feature Image: Nicola Brandt, Possession, Uakondjisa Kakuekuee Mbari, Namib Desert 2013. Digital Pigment Print, 73 x 100cm (paper size); 60 x 90cm (photo size), Edition of 3 + 2AP. Courtesy of the artist and Guns & Rain.